Riquewihr is a commune in the Haut-Rhin department in Alsace in north-eastern France. 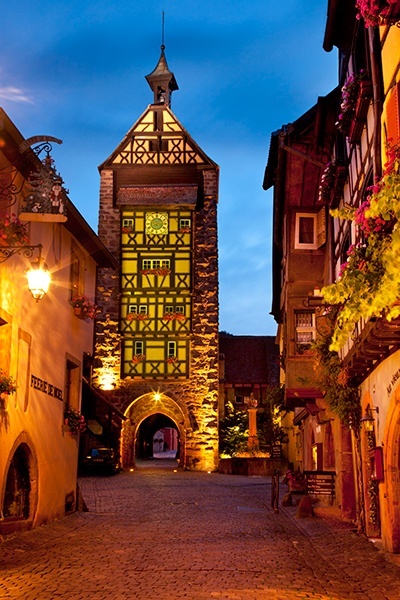 A popular tourist attraction for its historical architecture, Riquewihr is also known for the Riesling and other great wines produced in the village. Riquewihr looks today more or less as it did in the 16th century. Riquewihr was one of the few towns in the area not to be badly damaged during World War II. The town is surrounded by its medieval fortifications and is overlooked by a castle from the same period that is today a museum. There is a museum about Alsace during World War II and a torture chamber (La salle de torture). The village is a member of the Les Plus Beaux Villages de France ("The most beautiful villages of France") association.